Create your own artwork display. Hangs on any wall (with hanging slot). Easy to access the record inside. Takes double or single albums. These high-quality deep frames are perfect for displaying medals, crafts, keepsakes, scrabble letters, flowers and any other object that you can think which you can keep for a long period of time. Approx. product dimensions: 23 x 22 x 3 cm. This black photo frame wall clock is a beautiful combination of practical time indicator and decorative home accessory. This clock is a unique modern piece in any living area, bedrooms, kitchens and offices, decorate it with your favourite and memorable moments. The clock is powered by one AA battery, and the watch movement is a quartz movement. Through elegant design and the different frame sizes, this wall clock is a real eye-catcher, with the glance at the clock for time memorable moments are never forgotten. These high-quality deep frames are perfect for displaying medals, crafts, keepsakes, scrabble letters, flowers and any other object that you can think which you can keep for a long period of time. Approx. 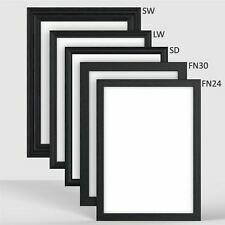 product dimensions: 32 x 32 x 3 cm. "Pearl Wedding Anniversary"! Ideal Gift for Wedding, Anniversary. I don't print pictures. Off white/Ivory with wood grain effect and is completed with a emblem etched with 'Grandkids'. Wood Grain Effect. Strong wood photo back. Hold four photos. Square Glitter Sparkle Mirror Glass Silver Freestanding Photo Picture Frame 3x3"
Silver Glitter Sparkle Stripes. ALSO AVAILABLE IN GOLD. 5 out of 5 stars - Square Glitter Sparkle Mirror Glass Silver Freestanding Photo Picture Frame 3x3"
1 product rating1 product ratings - Square Glitter Sparkle Mirror Glass Silver Freestanding Photo Picture Frame 3x3"
The apertures interlock, but don't overlap, so there is no cropping, the aperture will show the full photo. It has been cleverly designed with the landscape apertures on the four corners and one in the middle and then the four portrait apertures are simply slotted in-between. No box but haven't actually used it . Dispatched with Royal Mail 2nd Class. 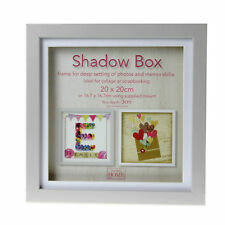 Personalised 3d box frame. Mothers Day,In Memory/ Birthday/ Wedding. Any special verse, design or occasion. Can be finished with pearls,feathers or crystals. LAST ORDERS FOR CHRISTMAS 24th NOVEMBER. Mr Mrs Wedding Photo Frame New Boxed Gift Just Married. Dispatched with Royal Mail 2nd Class. Video Cables. Colour: White. Buy It Now. Pet Accessories. LCD/TV Accessories. Car Accessories. Bicycle Accessories. 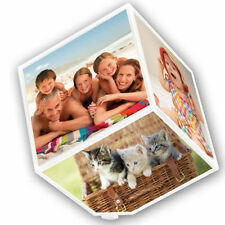 Ideal for 6x6" photo. Sits elegantly on your table displaying your favourite photo. Wedding Photo Frame “Mr & Mrs” BNIB. Condition is New. Dispatched with Royal Mail 2nd Class. 13cm x 18cm lovely gift for a wedding couple. The sparkled semi-circular lines, beautifully reflect the light and contrast with the plain glass border around the edge of the aperture. Video Cables. Colour: White. We specialize in computer. Buy It Now. Pet Accessories. LCD/TV Accessories. Car Accessories. Bicycle Accessories. Ideal for collage or scrapbooking projects. The plain wooden surface is suitable for painting and decoration. Features a sturdy wood chip backboard with hanging hook. Opening 7.5 x 7.5 cm (3x3") depth 2 cm. Personalised Family tree in White box frame, 23cm x 23cm, any colour theme! Personalised Family tree in White box frame, 23cm x 23cm. Each frame is handmade for you including satin ribbon, and diamante embellishments. All orders will be produced within 2 days and dispatched by Royal Mail 1st Class. Once orders are placed please message me with names, colour choices and any special requests. Wedding photo frame . Condition is Used. Dispatched with Royal Mail 2nd Class. FLORAL DESIGN WHITE IVORY WALL MIRROR 11 X 11"
The information I provide is based on fact, having been thoroughly researched to the best of my ability and resources available. LAST ORDERS FOR CHRISTMAS 24th NOVEMBER. Can be finished with pearls,feathers or crystals. Any special verse, design or occasion. Liquid Glass Contemporary Art, Champagne Bubble. Condition is New, in original packaging 3D art featuring 2 champagne flutes and bottle with glitter and diamante. Size: 56cm H, 56cm W, 3cm D Picture weight 2.5kg Have two for sale. Dispatched with Royal Mail 1st Class. The front of the album also holds and image so you can create your own style and effect. This album is available in three fantastic colurs - Blue, Pink or Black. • 1 x Pocket Album. This may be because you made an impulse buy or simply chose the wrong item. With a strut back to either hang or stand. You may use a maximum word length of 10 letters. (other colour card is available, see colour chart photo. Ideal present for any occasion including. The overall product may consist of no more than 40 letters in total. ). 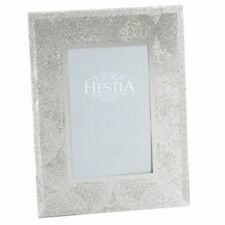 Tizo Design Siena Chain Link Silver Picture Frame 4" x 6"